The National Parks in the UK protect some of the most spectacular and valued landscapes in England, Scotland and Wales. It may surprise some visitors that they also protect farms, villages and cultural heritage. Unlike the national parks of North America, the 15 areas designated as national parks in the UK are not large, virgin wilderness areas owned by public bodies. They are, in fact, populated places, with much of the land in private ownership, where people who farm the land or settle in the towns and villages take part in preserving Britain's wild and worked landscapes. What is a National Park in the UK? Early on it was decided that, in many areas, British farming and village life had shaped the characteristic landscapes and should be preserved - even in relatively remote and wildly beautiful landscapes. So, while the national parks in the UK protect some of the most breathtaking wildlife and scenery and provide access and facilities for their enjoyment, they also protect buildings and places of architectural and historic interest and maintain established farming use. Within the these national parks, in England, Scotland and Wales, visitors can find a mixture of privately owned land and land owned or controlled by the National Trust, The Forestry Commission, the Ministry of Defence (MOD) and central and local government. There are mountains, moors, woodlands, marshland, pasture, lakes and coasts. Most UK national parks have numerous nature reserves that shelter rare species - native red squirrels, wild ponies, orchids, and ospreys. At least 446,897 people live in the National Parks of England, Scotland, and Wales - 120,000 in the South Downs, the most populous, alone. There are at nearly 5,556 ancient monuments within the parks. The Pembrokeshire Coast is the only part that has no scheduled ancient monuments (at the moment). And the South Downs, thus far, has the most with 700. They contain more than 491 Conservation areas which are protected areas of special architectural - rather than natural - interest. All the parks also have vast areas designated for special natural beauty and special scientific interest. England's national parks cover 9.3 percent of its land area. In Wales, the national parks cover 19.9 percent of the land. National parks cover 7.2 percent of Scotland. 8,972 square miles are included in UK National Parks. The largest park is The Cairngorms in Scotland, covering 1,748 square miles. The oldest park, The Peak District, was founded in 1951. One of the newest parks is The South Downs, confirmed as a national park in March 2010. Covering 1,748 square miles of central Scotland, the Cairngorms National Park is the UK's largest. It is also the northernmost national park in Great Britain. About 17,000 people live and work in the park, an area characterized by high, arctic landscapes, wild and windswept mountains and primeval forests. The park has five of Scotland's six highest mountains and boasts the cleanest rivers, lochs, and marshes in Scotland. Pine trees in the Cairngorms original Caledonian forests include a rare variety found only in Scotland and Norway. Wildlife watchers head to the Cairngorms to see Golden Eagles, Capercaillie, and the Scottish Crossbill, a bird only found in Britain. The park is home to wildcats, water voles and otters. Ruthven Barracks, where the Jacobite Scots soldiers gathered to disband after their defeat at Culloden. Museums and galleries - The Highland Folk Museum is a mile-long, open air museum showing how people lived in the Highlands from the 1700s to the 1950s. You've probably heard the song the Bonnie, bonnie banks o' Loch Lomond. The beautiful loch is one of many attractions of this park. By high road or low road, Loch Lomond, in Scotland, is the largest freshwater body in the British Isles. This is also Rob Roy country. The highland outlaw, romanticized by Sir Walter Scott, probably rustled cattle in these parts. He died, peacefully, of old age and is buried in a Balquhidder churchyard, within the national park. Also within the park, two extensive National Forest Parks and several fjord-like sea lochs where humpback whale and basking shark have been seen. Loch Lomond & The Trossachs National Park covers 720 sq. miles in the Scottish heartland, within an hour's drive for more than 70% of Scotland's population. It takes in a wide variety of landscapes - wild mountain glens, towering giants, rolling hill country, rivers, woodlands and lochs. 20 peaks between 2,500 and 3,000 ft.
Loch Lomond spreads beneath Ben Lomond (3,196ft.). Argyll Forest called the Arrochar Alps is rugged and dramatic, bordered and divided by the sea lochs - Loch Long and Loch Goill. The Trossachs are known for wild glens. Here Scotland's Highland Boundary Fault divides highlands from lowlands leading some to call the region "the Highlands in miniature". Breadalbane, in the north, is an ancient Celtic earldom studded with high peaks, including Ben Lui (3,703ft. ), Stob Binnein (3,822), Ben More and the higher of the Ben Vorlichs (3,232 ft.)- the other is near Loch Lomond. Walking is one of the most popular activities with several excellent long distance trails crossing through the park. The West Highland Way Scotland's oldest and most popular long distance walk. It passes east of Loch Lomond. The Rob Roy Way Follow the tracks and paths used by Rob Roy MacGregor across the Southern Highlands in the northeast corner of the park. Maps and advice about hundreds of shorter paths, tracks, and cycle routes are available at the national park tourist information centers. In a country not particularly known for big skies and wide open spaces, Northumberland National Park is a dramatic exception. Stretching from Hadrian's Wall to the Cheviot Hills along the traditional Scottish border, Northumberland National Park is one of England's emptiest quarters. Only 2,200 people live within its 405 square miles, midway between Carlisle and Newcastle-upon-Tyne. The park, at the top of England, is virtually in the center of Britain. Archaeological excavations show evidence of human occupation here for 10,000 years. And the mysterious hillforts that top many hills in the northern part of the park were probably built about 700 B.C. Before the Norman Conquest, this area was the center of the Anglo-Saxon Kingdom of Northumbria. It's scattering of historic villages, castles, burial cairns give an added dimension to touring and outdoor activities in the park. It's more recent history includes the designation of its Dark Sky Park, the largest area of protected night sky in Europe. Hiking, cycling, and riding are popular along quiet roads or off roads on moorland trails. Fishing, golf, hill running and rock climbing are all popular activities. Birdwatchers take advantage of Northumberland's vast open hills, grassy valleys and heather moorlands to spot native peregrine falcons, dippers, common sandpipers and gray wagtails, ring ouzel, and wheatears. There are skylarks, all sorts of warblers, kestrels, black grouse. And, around Hadrian's Wall, look for whooper swans, goldeneye, greylag geese, white-fronted geese, wigeon, teal, lapwings and tufted ducks. Photo enthusiasts, as well as film fans should head for Sycamore Gap to meet the most photographed tree in the UK. Designated as Tree of the Year by the Woodland Trust in 2016, this solitary sycamore, in a gap of Hadrian's Wall, was a featured location in Robin Hood Prince of Thieves and many other films. connections with leading literary figures, including Beatrix Potter, Wordsworth, Coleridge and Thomas de Quincey. England's only true mountain region, the national park covers 912 square miles (33 miles north to south, 40 miles east to west) - about 85 percent of the area of Rhode Island. Windermere, England's biggest natural lake is 10.56 miles long, a mile wide and about 220 feet deep. Wastwater, England's deepest lake has a surface 200 feet above sea level and a bottom 50 feet below sea level. Scaffell Pike, at nearly 3,209 feet, is England's highest mountain - called a fell - and considered to be one of the hardest of the UK's high peaks to get to. The word fell comes from the Old Norse word fjall for mountain. 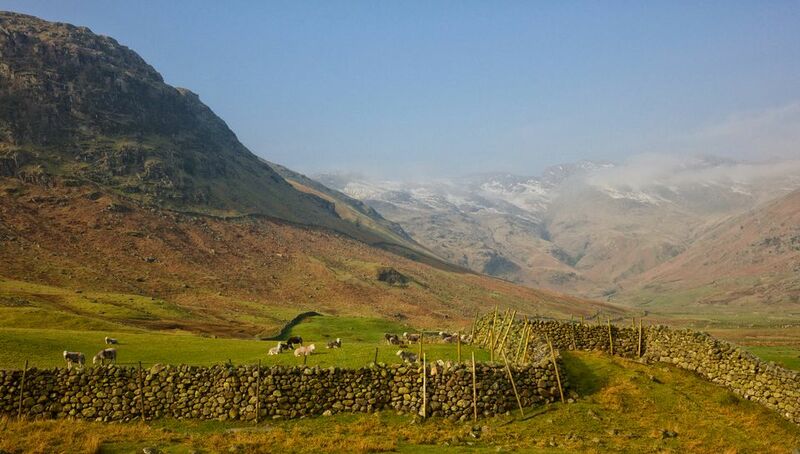 One of the most popular pastimes in the Lake District is fell walking. The challenges range from hills around Keswick and Derwentwater that are little more than modest uphill walks of a couple of hundred feet to difficult scrambling hikes to the top of Scafell Pike. Because the Lakeland fells are virtually bare and preside over vast, U-shaped valleys, the rewards of fell walking are the spectacular views. Daffodils near Ullswater inspired him. She often visited and wrote many of her famous stories around Windermere. You can visit her house, Hill Top. The Dales are broad and winding u-shaped valleys carved out by glaciers, that sometimes narrow near the bottom. The effect is of wide, gentle hills often cut by steeper slopes that finish in rivers, streams, and woodlands. The 841 square miles of the park covers part of West Yorkshire and Cumbria, across the Pennine Hills in the center of England. Established in 1954, The Yorkshire Dales National Park, with its great variety of habitats and varying topography, is one of England's most popular areas for walking -- for gentle strolls and more strenuous hikes. Some of the best limestone karst landscapes in Britain, with limestone pavements, outcrops, and caves. Scarce woodlands that give each dale its special appearance. the Howgills - grassy rounded hills with deep ravines that are markedly different from the rest of the park. Several spectacular waterfalls including Hardraw Force with a 90-foot single drop and Cautley Spout with a broken drop of 600 feet. Among the Yorkshire Dales features, several that are man made are characteristic of this region. An intricate, and ancient, pattern of dry stone walls creates enclosures across valleys and valley sides. Traditional stone field barns are thicker on the ground in Swaledale, Wharfedale, and Wensleydale than anywhere else in Britain. National Park Centers located throughout the park help visitors with planning and booking accommodations. Downloads available at the centers include geocaching routes, audio trails, and digital guides. GPS devices and audio trail MP3 players are available to rent at the centers. For serious hikers and scramblers, the Three Peaks Walk is a famous challenge in this national park. Pen-y-ghent, Ingleborough and Whernside are the three most famous hills in the Dales. If you complete the challenge walk - covering all three peaks in a 24 miles circuit in 12 hours or less - you get a certificate of achievement. But don't worry, there are well mapped paths on the Dales website for each of the peaks, separately. And shorter walks around the Ribblehead Viaduct take you to this amazing, long and curving rail viaduct, featured in the Harry Potter films. If you happen to be passing it when a train comes through, it is traditional to stop and wave at the passengers. Most of them will wave back. Heather covered moors, seductively dangerous peat bogs, ancient forests and a dramatic North Sea coast are all part of the North York Moors National Park. The park is dotted with villages of honey-colored sandstone and marked with historic abbey ruins, castles, and ancient pathways. Like all of Britain's national parks, the North York Moors protects a wide variety of natural habitats and wildlife. But visitors more interested in history, archaeology and literary landscapes will find plenty to enjoy here. The ruins of Rievaulx Abbey tower over the landscape. Whitby Abbey, above the seaside town of the same name, was the scene of the Synod of Whitby in 664, where early Bishops of the Roman and Celtic churches debated and agreed on the date of Easter. It's spookily atmospheric ruins inspired Bram Stoker to bring Dracula and his coffin full of Transylvanian soil ashore for his first landfall in Britain here. Emily Bronte also used the region for inspiration. The Bradford-born author set the fictional Wuthering Heights somewhere in the moors near the Haworth parsonage, where the Brontes made their home. Boat fishing trips with local fishermen can be arranged in Staithes harbor. In this picture book pretty village backed by the Cowbar cliffs, Captain Cook served as an apprentice shopkeeper before leaving to seek his fortune at sea. And if you like riding, this is the park to head for. There are 500 miles of bridleways, with stables, riding centers and schools that can arrange anything from a lesson or a day's hack to several days trekking or pony trekking in the hills. The Peak District National Park is the oldest of Britain's national parks and, perhaps because of that, it is the most characteristic of the features preserved in the parks. Its landscapes of hills and the wide, shallow valleys known as dales cover 555 square miles in the heart of England, across Derbyshire, Staffordshire and a small part of South Yorkshire. The area is historically rich, with hundreds of listed national monuments, stately homes, magnificent abbeys and storybook villages. The historic importance of the Peak District cannot be underestimated. It was here that the first major step in a campaign to establishing the people's right to roam the mostly privately-owned countryside was dramatically taken on Kinder Scout, a plateau that is the park's highest point. In 1932, 500 people walked from Hayfield, southwest of Manchester, to the plateau in what became known as the Kinder Scout Mass Trespass. It was one of the most successful acts of civil disobedience in British history. It led to the National Parks enabling legislation in 1949, the establishment of Britain's networks of long distance paths and finally, in 2000, the countryside act giving walkers the right to freely travel through common land and open country. It's a popular but challenging area for long distance walking. Visitors sometimes underestimate the distances and difficulties of walks in the Peak District. Happily, the annual, two-week Peak District walking festival in April and May has plenty of escorted walks - as well as more strenuous ones - to introduce visitors to the park. Stanage Edge, near Sheffield, and The Roaches, in the Staffordshire Moorlands, attract rock climbers from all over Europe and the park has opportunities for cycling and mountain biking, riding, canoeing and kayaking, fishing, sailing, windsurfing, hang gliding and gliding. The jagged peaks of Snowdonia are among the most ancient rocks on earth. The local culture is also rather ancient, with music and poetry dating back to the Bronze Age. About 65% of the local population speak Welsh, one of the oldest spoken languages in Europe, as their mother tongue. Betws-y-Coed, a village named for prayers in the forest. 90 summits above 2,000 ft. and 15 over 3,000 ft.
75% of its area in private ownership with the rest owned by the Crown, National Trust, MOD, Forestry Commission, other public bodies. The highest peaks are Snowdon (3,560 ft.) in the north and Cader Idris (2,929 ft.) in the South. Snowdonia is dotted with castles, some only ruins, some magnificent and at least one converted to a B&B! Gwydir Castle A privately owned, fortified Tudor House, the paneled dining room was recently returned from New York's Metropolitan Museum of Art. It's a B&B and open, in season, for day visits as well. Penrhyn Castle This National Trust property is a 19th-century fantasy worth visiting for the contents, grounds, and views. The views from the summit of Mt Snowdon are truly spectacular, taking in several lakes, nearby mountains scarred and shiny with slate and, in the distance, sea views and white sand beaches. There are several paths up, mostly long hard hikes rather than climbs or scrambles, but changing weather on the mountain means you have to be prepared. Or, you can be lazy and take the wonderful Snowdonia Mountain Railway to the top and enjoy the views change all around you as you pierce the clouds. Read about Climbing Mt. Snowdon -The Hard Way or the Easy Way. The Pembrokeshire Coast National Park in Southwest Wales, the UK's only totally coastal national park, protects 240 square miles, including a remarkable 260 linear miles, of the coast. Beaches, dramatic cliffs, caves and stone stacks as well as several offshore islands form stunning backdrops for rare native shore birds, marine, and coastal mammals as well as visiting Atlantic wildlife of all sorts. Choughs, skylarks, and stonechat populate the park's coastal heathland and birds hunt in wildflower rich hedgerows. Atlantic gray seals give birth along this coast; dolphins and porpoises visit regularly. Visiting see mammals you may see if you're lucky to include orcas and blue whales. This coast's Atlantic facing beaches are considered to be among the UK's cleanest and most beautiful. They are marked by wide, golden sands, fabulous dunes, and rock formations. Though the water is cold, these beaches are safe for swimming and some - though not all - have life guard coverage. Canoeing, kayaking, sailing, caving, coasteering, cycling, diving, riding, kite sports, rowing, surfing, swimming, and windsurfing are all widely available along this coast. On the other hand, if you'd just like to sit on a clifftop and watch the sea, or spot cliff dwelling puffins in binoculars, there's plenty of opportunity for that as well. Fishing and beach barbecues are permitted as well. And, if history and archaeology are your cup of tea, there's an Iron Age hill fort at Castell Henlley with reconstructed Iron Age roundhouses, and at Carew Castle, an ancient fortress and tidal mill. This 519 square miles of South Central Wales encompasses some of the most magical and mythical of Welsh landscapes. It's massive, bare and brooding mountains wrap around valleys filled with a patchwork of farms and fields or tower over lakes, known here by the Welsh name of llyns. The landscape is dotted with dolmens and standing stones, prehistoric tracks and hints of ancient peoples. The village of Myddfai claims to be the birthplace of modern medicine. It's legend, the Physicians of Myddfai, from in the Welsh national saga, the Mabinogion, includes a story of the Lady of the Lake at nearby Llyn y Fan Fach. The story is believed to be the origin of the Arthurian tale of the Lady of the Lake and Excaliber. The Norfolk Broads is the United Kingdom's largest protected wetlands, 117 square miles of lakes, fens, woodlands and grazing marshes between the medieval city of Norwich and the wide East Anglian Beaches of the Norfolk and Suffolk coasts. Popular for boating and sailing vacations as well as green holidays, it has 125 miles of lock-free, navigable waterways. The Broads are also a major commercial source of reeds and sedge for roofing thatch. The area's mix of wildlife management, livestock grazing and reed growing and harvesting contributes to an ancient and sustainable way of life. Remarkably, this water world, crisscrossed by rivers and channels and dotted with lakes (the "broads") was man made in the early Middle Ages. By the 12th century, records show that the local population had cleared this area of most of its woodland for building and fuel. Peat cutting started about then. It was abandoned by the 14th century because the peat bogs became flooded - much as modern quarries eventually flood. The way the Norfolk Broads came to be was only discovered in the 1950s when scientists realized the banks of the broads were vertical rather than the gradual slopes of natural lakes. If the ponies that wander freely around Exmoor seem to act as if they own the place, there's a good reason. Exmoor ponies have occupied this area of North Devon and West Somerset longer than humans have. They are the nearest breed Britain has to the original European wild horses and they are rarer than pandas. Exmoor National Park's 267 square miles includes high moorland and 34 miles of coast with highest sea cliffs in England, coastal forests, secluded beaches, and headlands. It has 300 miles of rivers and streams, leaping with salmon and trout. The otter population is on the increase and if you are very, very lucky, you may see some along a quiet riverbank. And Exmoor ponies (which graze wild but are actually owned by local people) are not the only prehistoric creatures here. Red deer have existed on Exmoor since prehistoric times and half the red deer in England live on the moor. With more than 450 miles of public rights of way, Dartmoor in South Devon is a walkers' and cyclists' paradise. It is also rich in prehistory with some of the best archaeological sites in Western Europe. New sites are uncovered regularly. In the summer of 2010, when Tottiford Reservoir in the park was drained for maintenance, a new prehistoric complex with stone circles was revealed. Burial mounds going back 6,000 years have been discovered and there are more than 1,500 burial cairns, 3,000 to 4,000 years old are all over Dartmoor. Like Exmoor, Dartmoor has its own ancient breed of native ponies. Archaeologists have found their hoof prints in Bronze Age digs. Owned and marked by local farmers, they nevertheless live and graze wild on the moor. Dartmoor has a variety of landscapes, valleys, bog and wetlands, ancient forests, castles, and ruins. Because of mists that sometimes cover the moors, Dartmoor has many myths and eerie legends associated with it. Sir Arthur Conan Doyle's Sherlock Holmes story, "The Hound of the Baskervilles" was inspired by Dartmoor. And today, stories of a big wild cat on the moor, perhaps a black panther, abound. Never proven, the stories of the beast of Dartmoor are a bit like the stories of the Loch Ness Monster and the Abominable Snowman. There's nothing new about the New Forest. William the Conqueror chose it as his royal hunting ground in 1079 and named it Nova Foresta. The forest is mentioned in the Domesday Book. Only about half the New Forest National Park is actually ​a forest. The rest is made up of lowland heath - the largest lowland heath area in Europe, pastureland, villages and shoreline. Nevertheless, the New Forest has the largest area of natural, deciduous woodland in Britain. And what forest there is ancient. The Knightwood Oak near Bolderwood is thought to be 500 years old. Even older, a common yew tree near St. Nicholas Church in Brocklewood could be 1,000 years old. The Norman church, by the way, is the oldest in the New Forest. It was where kings prayed when they came to the forest to hunt. The most unique ​aspect of the New Forest is the ancient system of commoning and the New Forest Commoners. The system gives Commoners the right to allow their ponies, cattle, sheep and pigs to graze and forage freely in the forest. It was formalized by law in the 16th century but had been the normal practice for centuries before. It's not unusual to be sitting in a charming pub in the New Forest and watch a couple of pigs lumber by, snorting up acorns and beechnuts as they go. Animals in the New Forest are owned by active Commoners, of whom there are currently between 500 and 600. Between 6,500 and 7,000 of their animals, wander freely in the forest. They are classed as wild animals and visitors should not approach them as if they were domestic animals. New Forest ponies are a recognized breed, but unlike the ponies of Exmoor and Dartmoor, they are not ancient. They originate from Welsh ponies, crossbred with Exmoor, Dartmoor and Highland ponies. The ponies have right of way over vehicles on New Forest Roads. Five caretakers, known as agisters look after the animals in the forest. Mares in have distinctive patterns cut into their tails. This allows the agisters to tell if the mare's marking fees have been paid and where the owner lives. Once a year, New Forest ponies are rounded up in "drifts" for health checks, branding and sales. The South Downs became one of the UK's newest national park in 2009. It's made up of England's chalk downs, stretching from the white cliffs near Eastbourne on the South Coast to Winchester. The park follows the 99-mile route of the South Downs Way, a prehistoric footpath across the tops of the Downs. It takes in dozens of historic towns and villages as well as prehistoric formations and tumuli. "My guide book was probably a giveaway, but I was still surprised when the bus driver who picked us up outside Horsham Station said South Downs Way? Where would you like to be let off?Friendly bus drivers offering unscheduled stops? We were off to a good start. "We were heading out for a day’s hard walking along the Downs, tackling a short stretch to see if we had the stamina to take on a bigger chunk of one of Britain’s most accessible long distance paths next time. "The South Downs Way glides over the downlands, its popular due to its range of challenges. Serious walkers can cover the entire distance in four to ten days, but good rail, road, local bus and taxi connections make it easy for beginners to join parts of the path for a weekend, a day, an afternoon. "We’d set out, on the last Sunday in June, to cover the six miles, from the West Sussex villages of Washington to Amberley in the Arun Valley. Here the path rides the ridge atop an escarpment. From Washington, a village path climbs to join the trail at the top of Barnsfarm Hill. Within minutes of leaving the village center, we were surrounded by a patchwork of grain crops. Red roofed farm buildings floated on seas of blue-green barley, feathery rye and summer wheat. Then cultivated fields gave way to pastures and grasslands quivering with poppies. Dozens of varieties of wildflowers thrive -- vetch, clary, scabious, pale flax, eggs and bacon, cinquefoil, scarlet pimpernel, several kinds of thistle and the tiniest white pansies we’d ever seen. "And we weren’t even looking. We were too busy taking in the dizzying views. The shallow, dry soil can’t support large trees so the view just goes on and on. On clear days, walking the South Downs Way can feel like flying over tiny villages, farm estates, and grand country houses. Long barrows, 3,000-year-old burial mounds, earthwork circles and the signs of prehistoric agricultural enclosures are visibly carved across the hills. "An enjoyable illusion of ancient isolation prevails. Yet, drop down out of the hills on a local footpath and chances are you’ll be near a village with a good pub and B&B or a paved road with a regular bus service.